Published in Astronomer's Telegram No.1120. 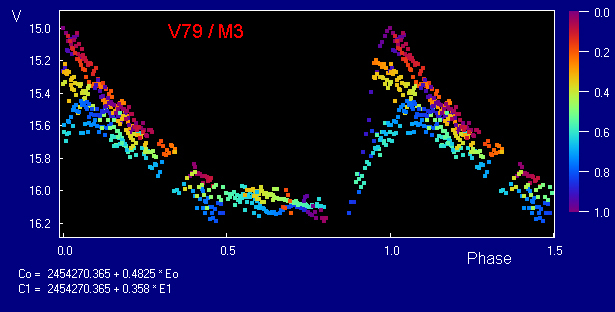 V79 was known as an RRab type star or fundamental mode pulsator with the period of about 0.483 day during the century after its discovery by S.I.Bailey in 1895. In 1996 it was unexpectedly found to pulsate in double mode (J. Kaluzhny et al., 1998, MNRAS V.296, p.347). The first overtone with the period of 0.359 day became the dominant mode. The switch of mode occured in April 1992. This phenomenon was unprecedented for the class of RR Lyrae stars. We perform CCD observations of V79 since 2007 June 5 using 60-cm telescope of the Sternberg Institute's Crimean Station and 100-cm telescope of the Special Astrophysical Observatory, Russia. Observations at SAI Crimean Station still continue. Number of our observations made in V filter exceeds 500. The observations show that V79 passes through the reverse switch from the dominant first overtone to fundamental mode. Periodogram analysis gives the only period of 0.4825 day, but not of 0.359 day. The light curve is typical for an RRab star with the amplitude of 1.2 mag, and shows the pattern of a pronounced amplitude modulation resembling Blazhko effect (the last 15 years its amplitude did not exceed 0.7 mag in V). The period of this modulation is unusually small and equal to 1.389 day, that suggests the beat period or resonance motion between the fundamental mode and the first overtone. Further monitoring of V79 is encouraged. Fig. 1. The light curve of V79/M3 in June 2007 was plotted with the fundamental mode period of 0.4825 day. Colours of points correspond to phase of the first overtone period of 0.358 day, the scale of these phases is given on the right. S.I.Bailey, 1913, Harvard Ann. V.78 (discovery). C.M.Clement, R.W.Hilditch, J.Kaluzny, S.M.Rucinski, 1997, ApJ V.489, L55. C.M.Clement, V.P.Goranskij, 1999, ApJ V.513, 767. C.M.Clement, M.Thompson, 2007, AAVSO Journal V.35 (Preprint No.55). V.P.Goranskij, 1980, Astron. Zirkular No.1111, 4 (in Russian). J.Roth, 1998, Sky and Telescope V.95 (February), 22. B.Szeidl, 1965, Mitt. Sternw. Ungar. Acad. Wiss., No.58.